Both Barendrecht and Ridderkerk are municipalities located in the southern portion of the province of Zuid-Holland (South Holland). At one time these were separate distinct towns, but today they comprise part of the “Greater Rotterdam Area”. A similar comparison here in Michigan is what we refer to as Metropolitan Detroit, which comprises the City of Detroit and the neighboring cities that surround its borders on all sides (referred to as “suburbs”). Situated directly south of Rotterdam is Barendrecht; Ridderkerk is located to the southeast of Rotterdam, sandwiched between the port cities of Rotterdam and Dordrecht (the oldest known town in Holland). Both cities are located on the IJsselmonde, which is a river island between the Nieuwe, Maas, Noord and Oude Maas branches of the Rhine-Meuse delta. The IJsselmond also consists of the following municipalities that are important to my ancestral past on my grandmother’s family tree: Hendrik-Ido-Ambacht and Zwijndrecht. The southern part of Rotterdam also lies on the northern region of this river island. The port where my great-grandparents and their small children boarded the Obdam for their voyage to the United States in March 1890 is located in this southern part of Rotterdam on the Nuewe Maas just west of the famous Erasmusbury Bridge. While doing research into the births and marriages of my ancestors from this region, I noted that sometimes Barendrecht was referred to as just Barendrecht and sometimes as West-Barendrecht. 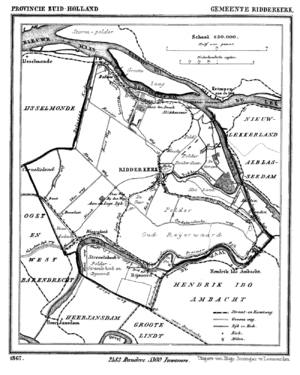 I recently learned that at one time this area was three fiefdoms: East-Barendrecht, West-Barendrecht and Carnisse, and the region was reclaimed from water around the 12th century. During the French occupation of the Netherlands, the three fiefdoms were merged into one municipality, Barendrecht. After the French occupation, its was split into East and West-Barendrecht, but in 1836 was once again united as just one municipality. The close proximity of the municipalities in the eastern half of IJsselmonde and its inhabitants isolation from the rest of South Holland until the 1800s may explain the marriage of individuals in my family tree from neighboring towns, such as my great-grandparents, Arie Smouter (whose family lived in Ridderkerk) and Adriaantje Andeweg (whose family lived in West-Barendrecht). Both Barendrecht and Ridderkerk were most likely more urban than rural towns even in the late 1800s. Today both of these municipalities have a population of approximately 50,000 people. Both cities have a blend of architecture from traditional Dutch architecture of this region from before WWI dating back several centuries, to modern post-WWII structures, to newer buildings that replicate the older traditional Dutch architecture. From aerial satellite views I noted that sometimes all three types of architecture could be found in a one block radius. One can reach both municipalities easily from Rotterdam via train or car.